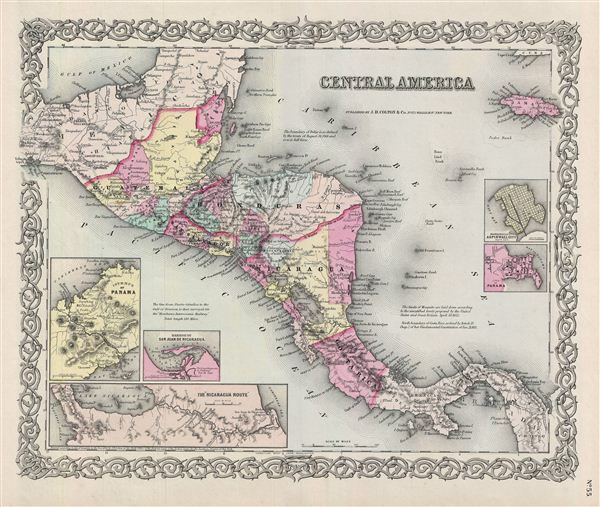 An excellent 1855 first edition example of Colton's map of Central America and Jamaica. Like most of Colton's North America maps, this map was derived from an earlier wall map of North America produced by Colton and D. Griffing Johnson. Covers from the Yucatan southeast as far as Panama and north as far as Jamaica. The lower left hand quadrant features three inset maps. In a clockwise fashion from top left these detail the Isthmus of Panama, the Nicaragua Route to the Pacific, and the Harbor of San Juan de Nicaragua. Two additional insets on the right hand side of the map show Aspinwall City and the City of Panama. This map was an area of considerable public interest through the 1850s. Before the construction of the Panama Canal the most practical route from the Caribbean to the Pacific was through Nicaragua. Known as the Nicaragua Route, this passage was controlled by the Accessory Transit Company, a property of the American tycoon Cornelius Vanderbilt. This vital trade artery was disrupted in 1854, as this map was being prepared, by the outbreak Civil War in Nicaragua. In an attempt to keep the route open, the Liberal Party of Nicaragua, under Francisco Castellón, enlisted the aid of the American adventurer William Walker. Walker invaded Nicaragua with some sixty armed 'colonists' and managed to have himself fraudulently elected President, after which is began an Americanization program that included reintroducing slavery into the region. eventually Walker's small private army was defeated by the Central American Collation and Walkher himself was repatriated to New York, where he faced charges for illegally waging war. Loathe to let go of his imperial ambitions, Walker again returned to the region, this time to British Honduras (Belize), where he was captured and executed by the British governors who saw him as a threat to their own economic ambitions in the construction of a trans-oceanic canal. This map identifies various cities, towns, forts, rivers, rapids, mountain passes, fords, and an assortment of additional topographical details. Map is hand colored in pink, green, yellow and blue pastels to define national and regional boundaries. Surrounded by Colton's typical spiral motif border. Dated and copyrighted to J. H. Colton, 1855. Published from Colton's 172 William Street Office in New York City. Issued as page no. 55 in volume 1 of Colton's 1856 Atlas of the World.